This is a simulation of the M3W. Amazing Stuff!! The more things change, the more they stay the same. 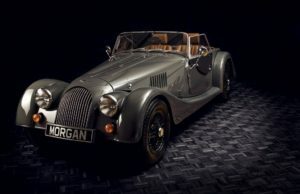 This 80th anniversary special edition Morgan is a nostalgic reprise of a classic car. The famous Morgan 4/4 is 80 years old this year. A special celebratory model is in order, and this is it: the imaginatively titled 4/4 80th Anniversary. The car hasn’t changed much over the decades, which is where its charm lays – or possibly not, depending on how you look at it. 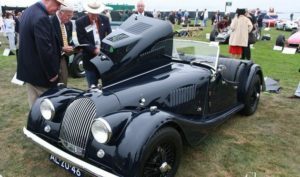 For fans, the limited-production Morgan will be a picture of delight, with its classic two-tone paint – in green, dark red or saxe blue – and a rather complicated-to-operate mohair drop-top. Details such as bonnet straps, brass grille and solid wheels held by brass centre locks are faithful to the roadster’s heritage and further enhance its charm. The old-school feel continues through to the 4/4’s drive. The suspension is stiff, as are the solid-feeling brakes, and the steering is less than communicative. It all starts to come together as the speed increases, though. The Ford 1.6-litre Sigma engine and Mazda six-speed manual gearbox work well together, and the popping and banging side-exit exhaust sounds suitably characterful. The light, 795kg kerb (1753 lbs) weight enables good performance, although things start unraveling if you push too hard. To get the best from the chassis, your driving habits need to be as relaxed and olde worlde as the car itself. Meanwhile, the cabin has a suitably classic feel, with Smiths dials, a lacquered walnut dashboard, woven carpet and leather trim for the rather upright seats. The 4/4 is hugely appealing to those who love classic engineering and motoring, and there’s enough of them to keep the British company thriving. That around all but 15 of the 80 models from this special run have been sold already is proof of that. 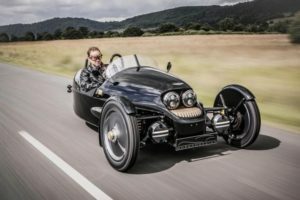 Morgan’s first electric 3-wheeler looks kind of like a happy tarantula. Remember when plucky old-school Morgan blew our hair back by revealing an all-electric 3-Wheeler concept at the Geneva Motor Show? The British motor company has rolled out the very first production versions of the world’s quirkiest new electric car, and it is exactly as charming as the concept. Dubbed the UK 1909 Edition, the first run of EV3s is built as a lifestyle collaboration with British department store Selfridges. Limited to just 19 examples, the special edition celebrates a number of British lifestyle, fashion and luxury brands, and comes with driving shoes, gloves, jacket, scarf, waterproof overalls, and more in the included Driver’s Kit. In the transition from concept to production, the EV3 kept a lot of its quirky charms, but it sprouted a fourth headlight. The resulting “face” of the two inboard headlights above the brass battery cooling fins gives it a look not unlike a pleased tarantula. The solid disc knockoff wheels and huge “magneto switch” direction selector on the dash complete the retrofuturistic look. Morgan says the all-electric 3-Wheeler has a range of up to 150 miles and a top speed of 90 mph. If you want a Morgan EV3 UK 1909 Edition, you have to A) live in England, and B) contact Selfridges there. 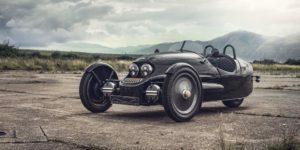 LEGENDARY car marque Morgan is combining with another famous brand Selfridges to launch the Malvern motor manufacturer’s first zero emission, all-electric car. The retro-futuristic three-wheeled electric vehicle, with an expected autonomy of between 120-150 miles depending on drive cycle and a top speed of around 90 miles an hour, has a beautiful bullet-bodied, face and exposed wheel design style, which takes inspiration from 1930’s aero engine race cars, classic motorcycles and 1950’s fantasy automatons. Brass conductive cooling fins encase the batteries and four large round headlights add to the overall boldness of the design which for the UK 1909 Edition limited edition comes in a luxurious yet understated black with Selfridges bronze detailing, reminiscent of the Oxford Street store’s famous bronze name plaque. The tail lift last seen in the late 1920’s on Morgan 3 Wheeler race cars, has been re-introduced, subsequently creating a visually forward stance with a seductive heritage look. This is enhanced with low slung running lights that carry through the cylindrical form of the side pods. An entirely new dashboard arrangement features a classic magneto switch for drive selection, a digital screen, and uses wood and treated aluminium throughout. As part of the unique collaboration, Selfridges has enlisted nine British brands to produce a driving kit with sustainable accessories for the contemporary recreational motorsports man and woman. The kit is priced separately but can only be ordered with the car. Some brands such as Alexander McQueen and Belstaff have found Britain-based artisans to manufacture their contributing accessory, instead of manufacturing it overseas as they do with their main lines, to ensure all elements of the UK 1909 Edition, from the car to the driving kit, are exclusively handmade in the UK. The full driving kit includes an exclusive Globetrotter case made to exactly fit the luggage rack on the UK 1909 edition, a bespoke Christopher Raeburn driving overall in waterproof materials, a George Cleverley pair of leather driving shoes made in the same leather and stitching as the car seats and leather detailing and Linda Farrow driving goggles in leather and bronze, plus other items by Dents, Belstaff, Alexander McQueen and Richard James. The UK 1909 Edition will be officially launched in store in Selfridges Birmingham on October 1 and in London Oxford Street on November 1. Together with the complementary driving kit, the car will retail at £49,999. It will be manufactured from November this year and be delivered to each customer within six months. 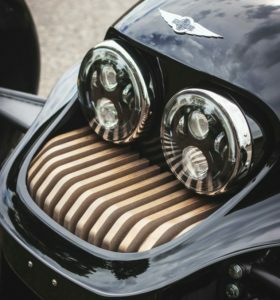 This week, the charming British company that builds charming wooden cars said it received a 6 million pound infusion of cash (that’s $8.5 million) for new electric motor development, in collaboration with Delta Motorsport and Potenza Technology. “With funding from the U.K.’s Advanced Propulsion Centre, the consortium will develop hybrid and electric powertrain systems which will significantly reduce vehicle CO2 emissions and deliver best-in-class fuel economy,” Morgan says in its release. Morgan will introduce these new powertrains progressively from 2019 on; all models will offer hybrid propulsion by the end of the decade. 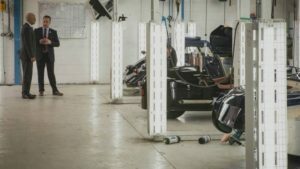 Morgan says it expects this to increase demand, and therefore increase the workforce at its Malvern factory in the U.K. Looking back, this isn’t a complete departure for Morgan, which developed the LifeCar (Lightweight Fuel Efficient Car) almost 10 years ago. The LifeCar was a fuel-cell hybrid Morgan Aero 8 that was built with the help of several universities in England. It was meant to have a 1,000-mile range, weigh less than 1,800 pounds and get 15 miles of all-electric driving. We’re not sure how many new customers a hybrid Morgan would grab in the United States, especially since the 3 Wheeler we tested a while back was everything right with the retro brand. Still, there seems to be room for a little bit of everything in the market, considering 2015 was a record-breaking year for car sales. They just don’t make them like they used to, do they? The Golden Era of driving may seem to be a moving target (it should be up to the mid-’90s by now), but no matter when it was, we know that things were just better then; before all these safety and emissions regulations, before all these nannies, before… well, just before. But if there’s one car out there that disproves the myth, and reminds us that the best days are really the ones we’re living through at any given moment, it’s the Morgan 4/4, a British sports car that’s been in almost constant production for 80 years. In 1936, most people hadn’t heard of television yet. Babe Ruth had just retired, Franklin D. Roosevelt was running for reelection for the first time, and our three most recent presidents hadn’t been born yet. World War II hadn’t started, the U.S. had 48 states, and the sun had yet to set on the British Empire. 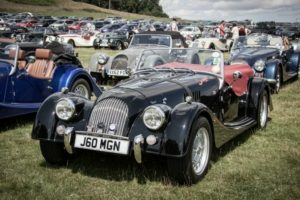 In the British West Midlands, the Morgan Motor company was celebrating its 26th year in business by releasing its first ever four-wheeled car. From 1910 to ’36, Morgan had produced a strange three-wheeled, two-seat car with a motorcycle-like V-twin engine mounted ahead of the front axle. 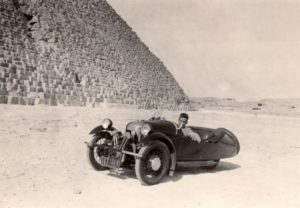 And just to drive the point home that we’re living in the golden age, the Morgan three-wheeler was reintroduced in 2012. But back in ’36, its new model was distinctively more car-like. 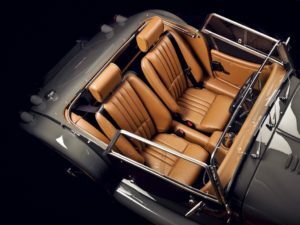 Dubbed the 4-4 because of its four wheels and 1.1. liter 34 horsepower Coventry Climax inline-four engine, the new roadster wasn’t unlike other sporty cars coming from other small British Automakers. It had a long, louvered top-hinged hood held down with leather straps, low-cut doors, and an ash wood frame under its aluminum body. 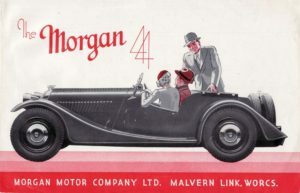 The 4-4 wasn’t a speed demon, but for its era, it was a nimble and lively roadster, perfect for the sporting British gentleman. In 1937, a four-seat version was introduced, and in ’39, a Standard 38 horsepower 1.2 liter four became standard. It was the last major upgrade the car saw before England was plunged into World War II. Throughout the course of the war, Morgan was kept busy building anti-aircraft gun parts and frames for military vehicles. In 1945, the British government gave the company permission to get back to building cars, with 50 three-wheelers and 75 4-4s built by year’s end. 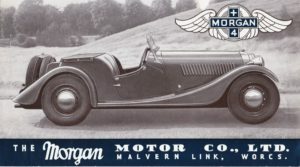 In 1949, Morgan decided to introduce a larger, more powerful version of its roadster, and call it the Plus 4. 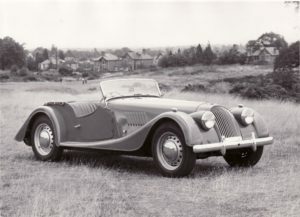 With a 2.0 liter 68 horsepower Standard four, and a 4-inch larger wheelbase, strengthened frame, revised suspension and hydraulic brakes, Morgan believed the updated car would be the way forward for the company, so they phased out the 4-4 for 1951, with the three-wheeler following suit and bowing out after ’52. But there was something undeniably special about the smaller car, and in 1955, it was reintroduced as the 4/4 Series II. Now using the chassis from the Plus 4, the car received a host of upgrades, including disc brakes, a 36 horsepower 1.1 liter Ford four, and revised styling that abandoned the upright chrome radiator grille for a more aerodynamic design. Options included a heater, tachometer, and a “Competition” package that added two SU side-draft carburetors and bumped horsepower up to an even 40. The 4/4 was a success for Morgan, but it also showed just how small the company was. It was largely unknown outside of England, and by the time Series II production ended in 1960, the company had hand-built just 386 of them. The Series III car bowed later that year, and despite looking virtually identical, its track was widened 2 inches, and it got a new 39 horsepower 0.7 liter Ford engine under the hood. Series IV and V came quickly throughout the 1960s, as the 4/4 received bigger engines, better brakes, and more robust suspension components, but on the surface, it had barely been changed since 1955. In 1968, the 4/4 hit its stride, receiving the 1.6 liter Ford Kent inline-four. In 1600 trim, the 4/4 would carry on largely unchanged for the next 25 years. Horsepower would reach the high-90s by the end of the 1970s, and in 1984, after 48 years, the 4/4 ditched its four-speed manual gearbox for a five-speed sourced from a contemporary Ford Sierra. In 1986, the 4/4 turned 50, but you wouldn’t know to look at it. By then, you could find a poster of the Lamborghini Countach on the wall of every young gearhead’s bedroom, Porsche had introduced its radical all-wheel drive 200-plus mile per hour 959 supercar, and Ferrari was putting the finishing touches on its carbon fiber F40. In stark contrast, the 4/4 had its carbureted inline-four Ford engine, a hand-built, ash wood frame under an aluminum body, and a steering rack that had just been updated for the first time ever. Instead of being consigned to history, the 4/4’s anachronistic reputation had made it a worldwide cult car, and waiting lists were so long that many buyers were left waiting up to a year for their cars. Safety and emissions regulations in the 1990s were tough on older models, and many would disappear from the world’s roads. Not so with the 4/4, which broke the 100 horsepower barrier for the first time in 1991 with a fuel-injected Ford inline four. Later, Ford’s Zetec engine provided 114 horsepower for standard cars, though between 2005 and 2009, a 125 horsepower “70th Anniversary” version served as the hottest 4/4 ever built. At the 70 year mark, fewer than 10,000 of the cars had been built; a testament to the company’s exacting hand-built standards. Now 80 years on, the 4/4 is astonishingly still with us, and it’s shockingly similar to the first four-wheeled cars to roll out of Morgan’s Malvern, England shop way back then. A slight redesign in 2009 saw the removal of the car’s nondescript flat bumpers, letting the front and rear fenders fall to the outermost ledges of the car. It uses a 1.6 liter Ford Sigma engine (the same one found in a Focus) paired with a five-speed manual from Mazda, and is now good for 110 horsepower and 97 pound-feet of torque. Morgan says the car will go from a standstill to 60 in eight seconds flat, and top out at 115 miles per hour. Inside, the car has been tastefully updated, maintaining its heritage while not coming off as antique. A brand new 4/4 would run you somewhere in the low $50K range – that is, if you could buy one in America. Unfortunately (though not surprisingly), they won’t pass safety and emissions standards here, so you’ll just have to be happy with whatever pre-1991 models you can import. Sure, it’s nuts to lust after essentially an 80 year old piece of technology, and you’re likely to get dusted off the line by a Toyota Corolla, but the Morgan 4/4 is a real, visceral link to the history of sports cars, and we’re incredibly lucky to still have it with us today. For those crazy gearheads who want nothing more than to put on a pair of driving gloves and marvel at how things today are the same as they ever were, the Morgan 4/4 is the greatest car in the world. May it live on another 80 years. 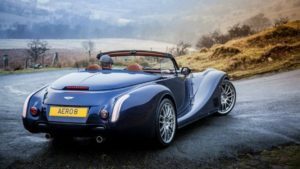 This is obviously good news for U.S. retro sports car enthusiasts, who have been missing out on many no-nonsense British vehicles throughout the years. Caterham ’s Seven, for instance, was only recently imported to the U.S. in dedicated North American specification. 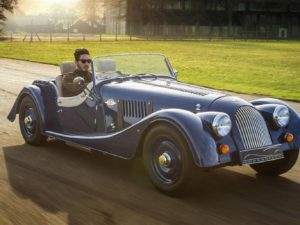 Morgan was the second neo-retro automaker that could sell its cars Stateside, but fortunately that has changed, and enthusiasts will have access to one of the very few cars that are still being built with a classic recipe. Sure, we probably won’t see a full lineup of Morgans on U.S. soil anytime soon, but one or two nameplates are better than none. Happy motoring! At last count there were over 200 vintage Morgan Three Wheelers and another 200 or so modern Morgan Three Wheelers (aka 5 Speeders) in North America. Many of these cars have been in the hands of their owners for decades, but they have simply been left at home when the other Morgans go out to play. So we have created a Three Wheeler only event! Morgan Three Wheeler Convention – May 2017. The first ever event of it’s kind in North America, to address these very issues. Let’s get the cars out if we can no matter their state or vintage. Let’s all get together in one place and have a few cars to poke and prod, and discuss. Other cars we can drive and compare. 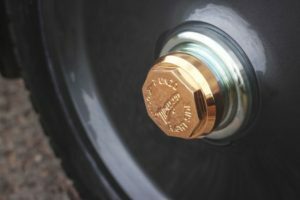 Let’s get together with other like minded folks to talk about pertinent stuff, like maintenance, safe operations, restoration, grease, and having fun . . . yes lots of fun! Visit the following link for more details. Like a race, a concours is just another type of competition. It helps if you go in prepared and aware of the ground rules. We’ve been on both sides of the judging game many times at major and minor events and more. But there are two guys who know this world even better than we do: Bill Warner, founder of the Amelia Island Concours d’Elegance, and Tim McNair, automotive detailer to the stars. Together we came up with some concours advice. Before we share it, though, here’s a caveat: Don’t take concours events too seriously. If you do, the competition will just eat you up. We build the show around themes and anniversaries. A car that fits the themes stands a better chance of being accepted than a car that does not. Having other national awards— AACA, CCCA, PCA,NCRS, etc.— helps us separate the great cars from the average. Fresh restorations that have not been seen at other shows get the highest priority with us, and the rarer, the better. If the car has been to every other significant show in the country before coming to Amelia, it stands very little chance of being accepted. We owe it to the patrons of the show to present a fresh, innovative show with rare and unusual cars. The car should not be misrepresented—for example, don’t advertise that it has been restored as a roadster when it was originally a sedan. We try to investigate each car to make sure it is correct. Have documentation with the car to show the judges in the event that it is necessary to confirm certain details. Although we try hard, judges can’t know everything, so have your documentation with you. The devil is in the details. Make sure the car is properly prepared, with all lights and horn operational. Charge the battery and put gas in the car. You just cannot imagine how many cars at Amelia have to be either fueled or jump-started. Know your car! There are many owners who have “handlers” to handle their car. The owner hasn’t a clue on how to start or drive it. For shame! If the judges ask, tell them what you know about your car. Help them understand what you went through to prepare the car for the show. • Don’t count on getting a trophy. Just come and have a good time. There are more important things in life to worry about. If you win an award, all the better.